It’s all fun and games until these birds lose their eggs. Angry Birds from Rovio Mobile & Chillingo’s Clickgamer is an insanely addictive and fun physics based iPhone game where you slingshot various birds to take out pigs in block made bunkers. So the story behind the game is basically pretty simple and shown to you in the form of a mini cartoon. Pigs have stolen the birds’ eggs and have obviously really upset these birds to the point that they want nothing but revenge on the pigs. Angry Birds is broken down into 3 levels, each with 21 challenges that you clear one at a time to unlock the next. Each level starts out showing you the pigs hiding in their bunkers and then the camera pans left to show your angry birds, screaming and grunting, ready to go to war. The bunkers are made from a variety of materials, mainly either glass, wood, or stone. Attacking is done by catapulting a set of birds from a giant old fashioned slingshot towards the pigs. You just tap and drag, then release when you have the angle right. As the bird hits the blocks, depending on what its made of, it breaks, shatters, or cracks, and the bunkers start to crumble down, eventually toppling over, crushing the evil piggies. The physics in Angry Birds is amazingly fun and lifelike. Each level adds a new challenging and fun puzzle of bunkers to break, and as you go on you get more and more birds to shoot out, each with their own unique characteristics. Tapping on the birds as they are in flight engages their super powers and also fires off their goofy and funny sound effects. The sounds in Angry Birds is actually one of its main strengths, so be sure to turn up your volume. The birds are so eager, and have attitude, and you hear it in their voice and its really quite a blast to listen to while you play. The pigs are also pretty funny and blurt out little sayings as they die, and an evil laugh when you lose a round. The music played through the Angry Birds is very original and entertaining as well, and it reminds us of the music you hear at the Disney theme park sometimes. Very cheerful and upbeat. Finally, even if you finish each of the levels, you can go back and try to improve your star rating by destroying the bunkers with fewer birds each time. A little tip to help you aim long shots: you can zoom out to see the entire field by pinching. Red birds: Are pretty powerful, they fly pretty far but don’t really have a super power. These are good for plain and simple destruction of wood and stones. Yellow birds: These are great for ramming through a bunch of wooden or glass blocks. Tap them in flight and they get a boost of speed as they attack. Blue birds: These are little tiny birds, but tap them in mid air and they become 3 birds. Using them in the right place is great for causing enough damage to kill a few pigs. White birds: They are pretty fat so, they don’t fly too far, but tap this angry bird in mid air and it drops a large egg that acts as a bomb, destroying anything it hits. Black birds: Probably the most powerful of the Angry Birds bunch, the black birds are like cannons. Tap them in mid air to explode. Or better yet have them land on blocks of rocks or wood and watch them explode in a few seconds, taking out everything around them. Update: Version 1.5.1 has been released adding 15 new levels. Plus a Super Bowl ad tie-in. Watch the Rio Movie commercial during the 4th quarter of the Super Bowl to find a hidden clue which unlocks a special level of Angry Birds. There’s also an in-app purchase for $0.99 to add Mighty Eagle to the game. 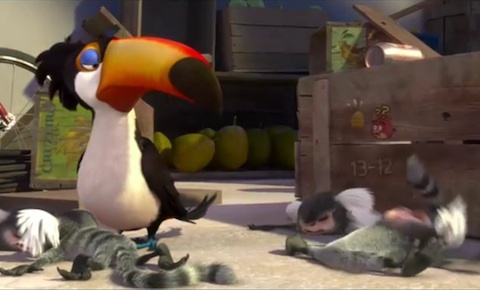 If you missed the Super Bowl Ad for Anygry Birds Rio, here it is. There is a hidden code in the last few seconds of the ad written on one of the boxes that you can use to unlock a special level. In case you can’t find the code, here’s a screenshot to help you out. Update: Angry Birds Rio is now out for iPhone. Update: The first big update to Angry Birds added 40 new levels, two new environments & integration with the Crystal online community by Chillingo. Overall, Angry Birds is the best iPhone game we’ve played this year so far, and we can’t recommend it enough. Easily worth the $2 and sure to keep you busy for days. AppSafari review of Angry Birds was written by Joe Seifi on February 7th, 2010 and categorized under Adventure, App Store, Featured, Fun, Games, Line Drawing, Puzzler. Page viewed 9373 times, 1 so far today. Need help on using these apps? Please read the Help Page. This looks awesome! I have a (not so) strange urge to eat breakfast now..
1. 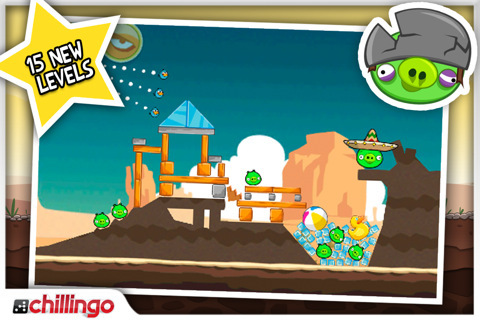 A fun background storyline: In Angry Birds, players take control of a flock of birds that are attempting to retrieve eggs that have been stolen by a group of evil pigs. Whereas in Crazy Coin, the story is not as appealing, just to collect crazy coins and try to win high scores. We need something more exiting! 2. Fun sound effects: In Angry Birds, fury birds chanting “Angry, Angry, Angry”, evil pigs snore, plus fun sounds of crashing shelters. In Crazy Coin, there are birds, coin sounds as well, but they need to be more fun. 3. 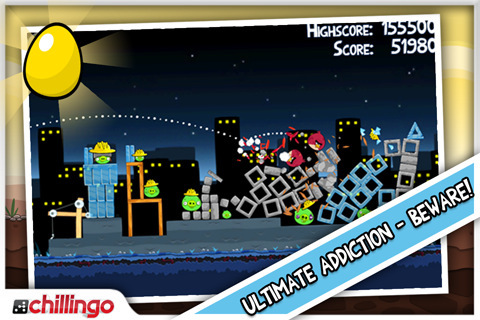 Score scheme: In Angry Birds, you have a goal, i.e., to destroy evil pigs in sheltered structures. Also, on top of that, you earn scores and are stared accordingly, which is challenging. One can play the same level over and over again just to get more stars. However, Crazy Coin has a limited scoring scheme, just reach the score, then you pass on to the next level. These seem trivial stuffs, however, it only take a few “trivial” improvements to get a game’s rank in the iTunes App Store up by hundreds or even thousands. I love all the angry birds free versions its fun and challenging game but mostly fun.